So, what about books? How do YOU read, buy, store and (maybe even) write books? 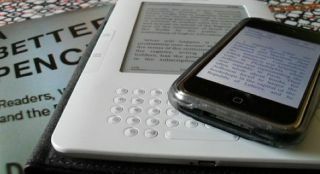 Are you opposed to reading digital books? Are you clinging to the smell and feel of the hard cover? Are you a hybrid? Have you completely abandoned paper reading and writing or holding on to it? How do YOU purchase and store your books? I think we are part of history in the making and have a unique opportunity to document our thoughts and practices. Please chime in. I have always been a reader and a writer! The kind who spent all her pocket money as a child on books and dreamed of owning one day a book shelf big enough to to hold all these books. The one who suffered by having to leave books behind when moving several times across continents. The one who had been inspired by Anne Frank to write diaries at the age eleven and continues to do so thirty years later... I am really intrigued by the way that reading, writing and purchasing books is changing in my life time. Actually it seems to be changing right in front of my eyes. I am witnessing how my own children, who are currently between 15-20 years old and respectively going to High School and College here in the USA, have a different relationship to reading and writing already. I am very conscious of my own changing attitude towards reading and writing and habits of purchasing books. I am curious how some of my friends are strongly opposed, struggling or are completely oblivious to this change. I just love how books smell. Nothing compares to cuddling up with a book in your hand. Handwriting a note is more personal. It is just not the same. I am completely in agreement with these responses...but... the difference is exactly what I am appreciating. I am not expecting reading and writing (digital and analog form) to be the same. I am seeing both versions as being complementary and not in competition with each other. Since I might be a hybrid being, in between generations by having experienced both, I am in the position to observe both sides of the fence. Writing I have written about Hyperlinked Writing and Reading before. Writing digitally allows me to write "multi-dimensional". I am able to link to further information, reference my train of thoughts, insert an image to visualize my ideas better and embed videos or audio as references, inspiration or clarification. That ability does not take away from my experience and enjoyment when I use a fountain pen and write in my personal paper diary. They simply fulfill two distinct functions in my life. Storage I am starting to maintain several types of bookshelves, a physical (Ikea), a virtual (Shelfari) and a digital (Kindle) one. They are not mutually exclusive and, again, fulfill different functions for me. Standing in front of rows and columns of my physical books gives me a a feeling of seeing old friends, allows the physical sensations of pulling a book here and there to thumb through it, revisit old stories and "smelling" that famous smell only old books can give you. I am also able to hold the same copy in my hand that I held as a child with my 10 year old handwriting on the cover or the book my father gave me as a present. The virtual bookshelf on the other hand allows me to share titles of books of my interest with others from around the world. The virtual bookshelf also connects me to groups who have similar interests than I have. Once I hear or discover a book I might want to read in the future, I place it on my virtual bookshelf under "I plan to read" shelf. At a later time, when I will be looking for a book in a physical bookstore, I simply use my iPhone and log into my Shelfari account to remember the title and author of the book I wanted to check out and possibly purchase. My Kindle now holds my entire digital book collection. I could store about 1500 books on it, which I can carry around with me all the time. No more picking and choosing which book to take with on a long plane ride. I can carry my entire library in my purse. When moving overseas in the future, I will not have to pack my books into boxes and leave them in storage. Another added bonus is the syncing feature of the Kindle to my iPhone. I am able to pick up the last "page" (screen) I read and continue reading from the other device my book. Purchasing My purchasing habits have also changed over the past few years. I used to exclusively make trips to book stores, browse for hours on end, then purchase a book or two. Once Amazon.com came along, I started pre-viewing books by reading online summaries and reviews before I either ordered them or, if I did not want to wait for shipping, drove to the bookstore to purchase a copy in person.Then came along my iPhone and the Kindle. I am able to instantly download the electronic version of the book.The digital versions of the books are also cheaper than their analog brothers. No more trips to the bookstore and no more wait time... Do I still go to Barnes & Noble? Do I still purchase hard copy books via Amazon? Yes! The different methods of purchase "books" complement each other and fulfill different needs for me. Reading So, how is reading a book changing and why are some people so passionately opposed to it? While I like holding paper in my hand and feel and smell the "traditional" book, I also like to read on the computer screen to enjoy the multimedia and functions that a "flat" book does not provide for me. How often have I wished I could simply use the CTRL- F (Apple- F) function to find a word or phrase I was looking for in a hardcopy book? How often have I wished to be able to click on an idea to get a further explanation or for being directed to more resources? I am increasingly liking being able to read with my Kindle too. The time from getting a recommendation (word of mouth, twitter, blog, newspaper, etc.) for a book, to checking a summary out (from reading the book sleeve to simply downloading a sample of the book) to being able to start reading the book is seamless with time not being a consideration. I am able to "look up" words in the build in dictionary, that I am unfamiliar or unsure of (English is my third language) by simply moving the cursor to it. The phrase "look up" will probably have to be overhauled to say "look down" since the definition is on the bottom of you screen :) Reading the definition is becoming seamless. There is no interruption of my reading by putting the book down, picking up a dictionary, looking for the definition then going back to the book and placing the definition within the context. I am learning new words, which before I would have over-read and forgotten, not taking the time to look them up. Being able to "highlight" and annotate passages is becoming increasingly convenient and interesting. This is especially convenient, when I want to blog about a quote I read later on. The syncing function to my iPhone is awesome! is popping up on my RSS reader, in the news and several books on the subject are being published. I am realizing that history seems to be repeating itself (as it does frequently). The fear, the euphoria, the reluctance, the pioneers, the refusers have been there. Every time new "technologies" are emerging and start threatened the ways things were done up until that point. The explosion of electronic modes of communication is as revolutionary as the invention of printing with movable type. and we are having as much difficulty in assimilating it as readers did in the fifteenth century, when they confronted printed text. The journey from pencils to pixels is just a start. Computers and the internet are neither the best developments in the history of writing, nor the worst. They are simple the latest in a series of innovations of how we do things with words. You can use these devices [iPhone, Kindle] and it saves time, money and effort and it is a way to get to more stuff than ever. can be easily updated, discussed, include multimedia, fund through search... the form of the book itself must change. LA Times After a decade of fear, we're connected to writing in new ways Our relationship to the written word changes and evolves - but it doesn't go away. NY Times Does the Brain Like E-Books? So, what about books? What is your take on them? Let me ask again. Are you opposed to reading digital books? Are you clinging to the smell and feel of the hard cover? Are you a hybrid? Have you completely abandoned paper reading and writing or holding on to it? How do YOU purchase and store your books? I think we are part of history in the making and have a unique opportunity to document our thoughts and practices. Please chime in.